We are word game junkies and pushers for that matter. Scrabble is a family obsession, but we will try any game that involves words. The photo above is one of my mother, ninety-two years old, pondering her next move. 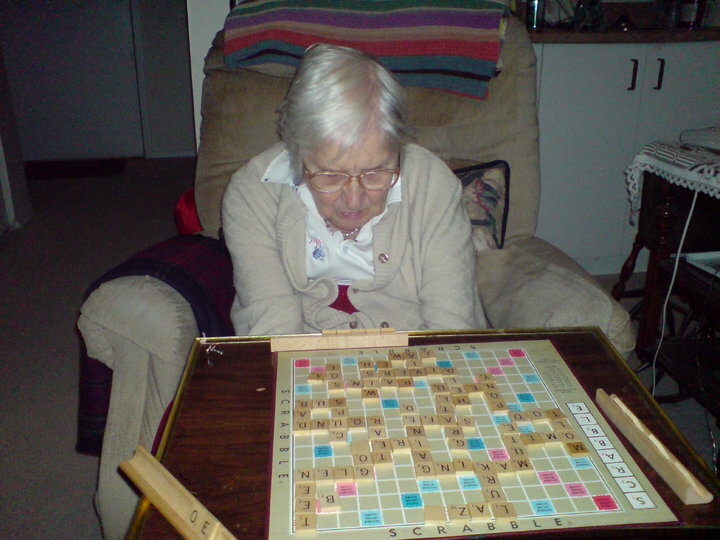 Mom was having trouble with dementia at the time but not when it came to Scrabble. She would start off with a few small words, but after a warm-up we noticed she was going for the triple word scores. Got to love it. My dad was suffering from cancer and taking heavy drugs for the pain which caused him to be drowsy. He would fall asleep during lulls between turns, but he would wake up and put down a word using all his tiles. ” Damn,” we’d all complain, “we can’t even beat you on morphine.” We sure miss our favourite gamesters now. My brother, sister and I, (and now all our children) grew up playing Scrabble, but we also enjoyed playing other word games. We even played car games with words. On long car trips we’d play alphabet games such as “Hangman” or “I Packed My Suitcase and In It I Put….” or naming countries or celebrities using the last letter in the name to make the first letter in the next name. Word games were a relief after the umpteenth chorus of “99 Bottles of Beer on the Wall” or “Ten Little Monkeys Jumping On the Bed”. Now we did play other board games like “Monopoly” and “Life”, but our favourite games involved words. “Balderdash” is a lot of fun because it introduces very obscure words for which each player has to supply a possible meaning and everyone must choose the one they think is the real definition. We laugh a lot in this game as most of the daffy definitions are quite funny. There are games in which you have a time limit to list items beginning with a certain letter or in a particular category (eg. fruits that are red). Games in which you must give a clue to another player are fun as well, whether they involve miming, words or drawing. Our family has had its fad games of the moment as well. We all became enthusiastic about “Trivial Pursuit”, taking special pride in that it was a Canadian game. My husband and I own at least five different versions. As a matter of fact, we have a cupboard full of board games. I’m hoping that as our grandchildren get older the games will see a lot more action. I don’t know where the root of our fascination with words began, but I suspect it was with a mother and father who loved the spoken and written word. They read to us at bedtime and any other time we wanted it. My father enjoyed reading aloud and my husband does too. He read aloud to our children at bedtime from wonderful fantasy novels and he would individualize each character’s voice. Our children loved it and so did I. Over time during our marriage, we have also read aloud to one another from the Bible, poetry and fiction. Listening has advantages over watching television. The imagination is a wonderful entertainment tool. Thank God for our voices. Words are an amazing treasure. They become tales around a campfire, poetry to a lover, lullabies for a baby, and cues to an actor on stage. In music, words can open up the locked mind of a person with alzheimers, even for the briefest moments. As well, if you are in need of some solitary entertainment, pick up a crossword puzzle or a scrambled word puzzle. Or crack open the box of “Spill and Spell”. Word games are presents that keep on giving, especially in this family. I remember playing “Stock Ticker ” and I also played a game called “Pay Day”. Another favourite of mine is “Masterpiece” which is all about the buying and selling of art masterpieces. It is fun because you don’t know the actual worth of the painting you are bidding on and sometimes it turns out to be a fake. I checked out your blog and had a great read. I enjoy your quirky sense of humour.